On St. Patrick’s Day, everyone is Irish. But what about the rest of the year? 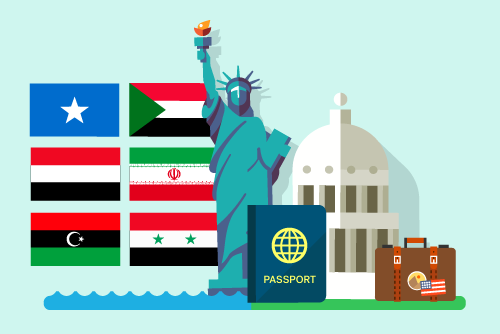 Twenty-two million Americans — 7.2% of the population – say their “primary ancestry” is Irish, according to the Census’s American Community Survey. 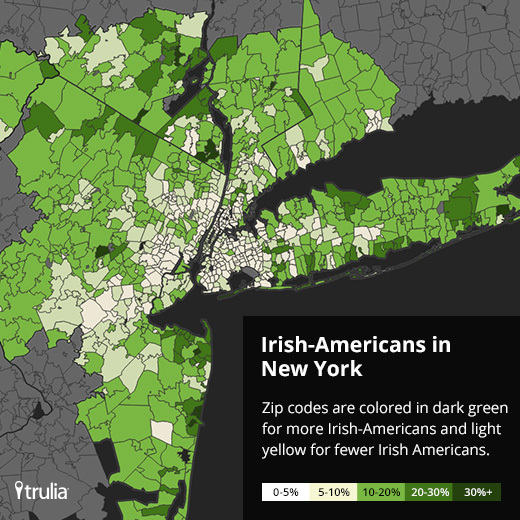 Another 13.5 million Americans claim at least some Irish ancestry, bringing the total to 35.5 million Americans — 11.6% of the population — with at least partial Irish ancestry. If that sounds low, remember that Ireland’s population today is just 6.4 million – 4.6 million in the Republic of Ireland and 1.8 million in Northern Ireland. So there are more than 5 times as many Americans with at least partial Irish ancestry as there are people who live in Ireland. Among 100 largest metros. Primary Irish ancestry only. 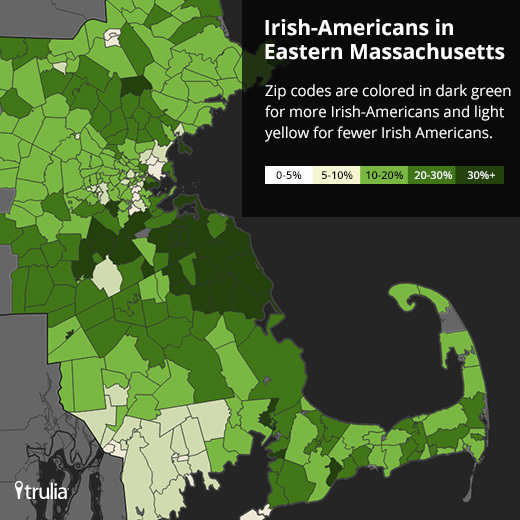 These maps of greater Boston, New York, and Philadelphia show that the most Irish neighborhoods tend to be in the suburbs, while the central parts of these cities are much less Irish:Of these top 10 Irish neighborhoods in America, eight are suburban. The two within big-city limits are far from the city center: Breezy Point/Rockaway Point and Mount Greenwood are around 20 miles from Manhattan’s Wall Street and Chicago’s Loop, respectively. 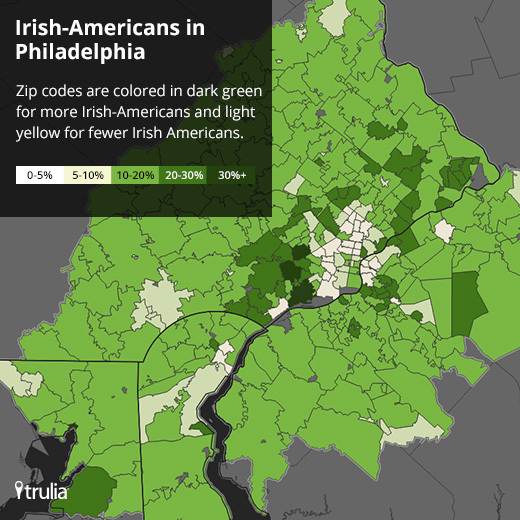 The most Irish neighborhoods have something else in common: five out of 10 are right on the water. Breezy Point/Rockaway Point and Point Lookout are both on the Atlantic Ocean, as are North Weymouth and Marshfield on Boston’s South Shore. And Crum Lynne, west of Philadelphia, is right on the Delaware River. Among largest 100 metros. Does not include searches from Northern Ireland. Primary Irish ancestry only. Based on search traffic in 2011 and 2012. Finally, where are people from Ireland looking for vacation homes in the U.S.? 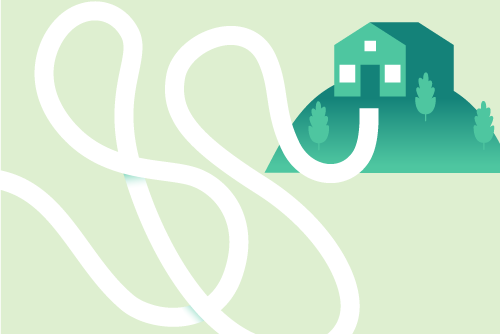 Trulia search traffic reveals that the traditional vacation or resort towns with the highest share of foreign searches coming from Ireland are on Cape Cod, MA, including the communities of Dennis Port, Cotuit, West Yarmouth, and North Falmouth, as well as Boothbay Harbor, ME. 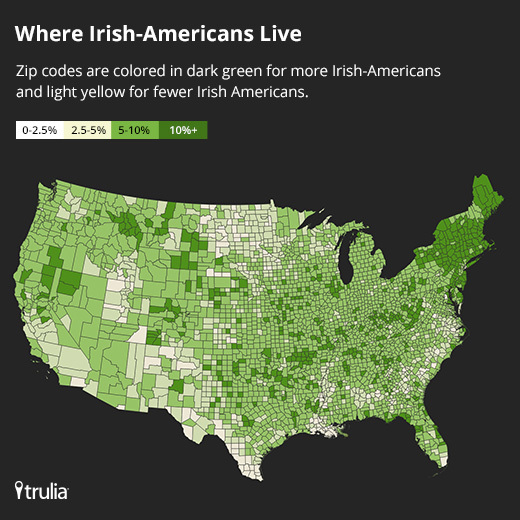 But there are some differences between where Irish-Americans live and where people from Ireland are looking at homes in America. Lake County–Kenosha County, IL-WI, which is north of Chicago, and Raleigh, NC, both rank near the middle of the 100 largest metros in Irish-American population but are on the top 10 list for share of search traffic coming from Ireland. In the other direction, Camden, NJ, and Wilmington, DE, both are among the top 10 metros for Irish-American population (see chart above), but rank much lower (48th and 71st, respectively) in share of search traffic coming from Ireland today. Therefore, people from Ireland are searching more in places with large Irish-American populations. 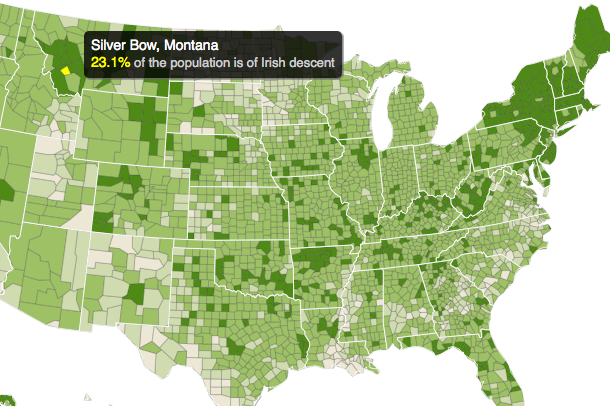 America’s most Irish towns today are likely to remain strongly Irish for many St. Patrick Days to come. 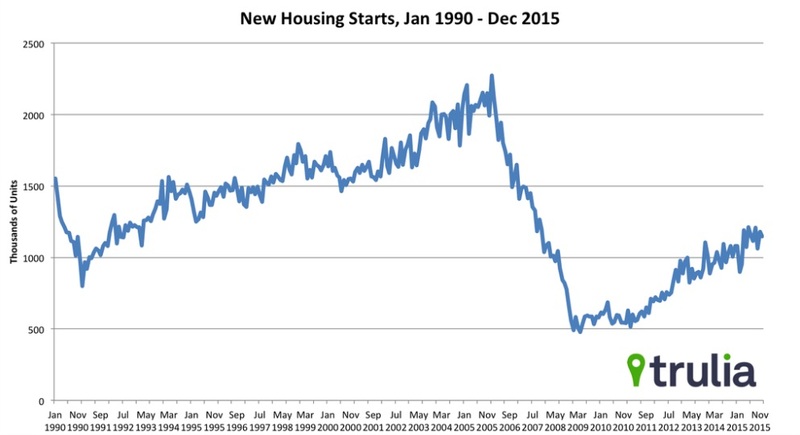 December's lower-than-expected numbers aren't enough to diminish the bigger trend, that is: last year's housing starts were the strongest in nearly a decade. 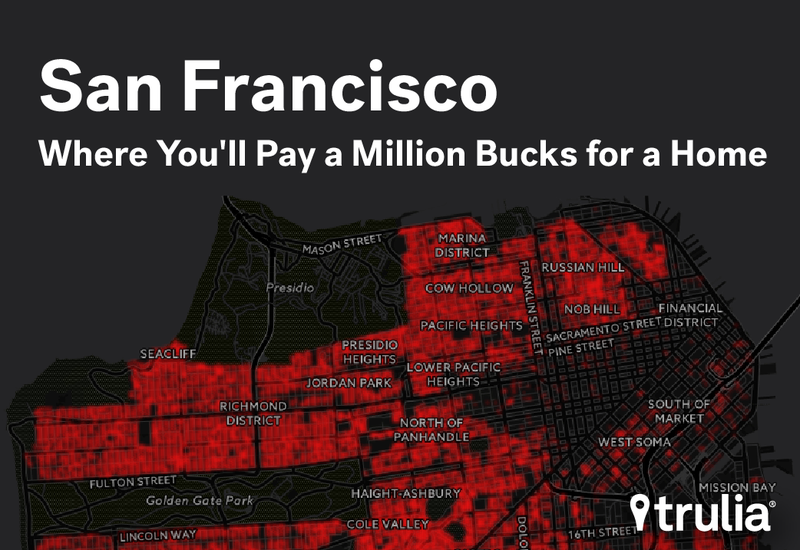 Million dollar homes in San Francisco have more than doubled since 2010, and some neighborhoods have seen even bigger spikes.